(1931) El Coyote, Hollywood | Remains of L.A. 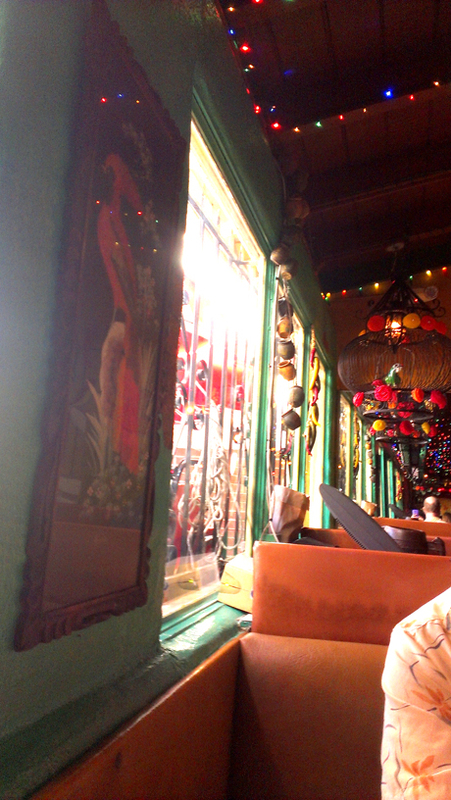 Went for lunch at El Coyote with David (my husband). It’s decorated in a fantastic, fun, manic way and is another place I’d read about before I even lived here. I never thought the food was as good as the decor, but I’d heard it was under new management so I thought I’d try it and found it much more to my liking now. -Murals all over the walls, multi-colored Xmas lights on the ceiling, ceramic parrots in hanging cages wrapped in lights shaped like jalapenos, hanging stained-glass lamps, flowers and figurines and paintings everywhere. In the foyer one wall and slanted ceiling is covered in celebrity headshots, and opposite that is a wall-sized display case of souvenirs and cheap toys that are, apparently, for sale. They have price tags on them, anyway. There is color everywhere, there doesn’t seem to be an inch left undecorated. -We got guacamole to go with our chips and salsa, and I got the combination, which included a (delicious) green corn tamale, rice, refried beans (which were, startlingly enough, probably the best I’ve ever had) and a beef taco I did not particularly care for but which David (my husband) was happy to eat for me. -The waiter had a Jamaican (I think?) accent and kept calling us “young folks” and “young man” and “young lady,” which seemed to me to be stretching it a bit but then I noticed he was calling the people at a nearby table the same things, and they were all eighty if they were a day. -When we ordered guacamole, the waiter asked us if we wanted it chunky or smooth. I asked him to bring whichever he preferred, so he brought the chunky kind but repeatedly assured us that if we didn’t like it, he’d bring us the other kind right away. I liked it chunky. -The two people at the table across from us were fascinating. When I first got to the restaurant, they were sitting outside smoking but came in when their food was ready. The younger guy, in his mid-twenties, looked like a youth from an Italian renaissance painting, except his clothes were expensive preppy style rather than artfully draped cloth. The older man, in a somewhat shaggy white beard and plaid shirt, had a tinge of vagrant about him. He got drunker and drunker as the lunch went on, and kept moaning a lot and saying things like “Oh, I’m so full! But I guess I’ll have another drink, will you have another drink? Well, I will anyway.” Only there was more sighing and groaning than I’ve made clear. Other things the old guy said included, “I didn’t know he’d turn purple! Look at him, he’s all colored!” and “You’re sure you don’t want mustard? You sure? There’s plenty left!” (this after covering his hamburger so entirely in mustard you couldn’t see it. The other guy was having an enchilada and, I’m happy to say, didn’t put mustard on it) and “oh, did I drink the whole thing? It’s all gone… maybe another.” When the bill came the younger man grabbed it and the older man said, “Oh you son of a… Well, I’ll pay the tip!” and then he made a giant production of calling the waiter over and demanding to know the amount of the check and giving him the tip. As they were getting up to go, the older man stumbling quite a bit, he said to the younger man, “Well, now you know, your father drinks!” which was surprising because both I and David (my husband) thought they’d just met. Which of course maybe they had. -The waitresses all wear very pretty, very fancy dresses covered in flounces and frills and flowers. The waiters are all in black pants and white shirts and some of them have maybe an interesting tie. I bet they’re secretly bummed they don’t get to be fancy. -As I was wandering around the restaurant trying to find the bathrooms, I passed a woman carrying a little girl–maybe three–in an adorable leopard print dress. I went into one of the farther back rooms, discovered the bathrooms weren’t there, and when I came out the other way I passed the same little girl, this time being carried by her father. I couldn’t figure out how they’d moved so far so fast, and switched carriers, but later I passed their booth and realized there were two girls and they were identical twins. I wish I was a twin; the opportunities to confuse people seem endless. -I finally found the bathrooms, down a somewhat poorly-lit hallway. Coming back out of the hallway I was walking towards an old-fashioned wooden phone booth and was thinking about how much I love those phone booths because they make me think of so many old movies, and then my heart almost stopped because in the dim light I could just make out a man standing in the booth, glaring at me. It turned out to be a mannequin, dressed in what looked like (but might not have been) a toreador outfit. I still like those phone booths, just not that one as much. -Sitting a few booths behind us were three women who thought everything was “amazing” and kept saying so loudly and laughing a lot. It could have been annoying but wasn’t; just a pleasant backdrop to the meal. It was the kind of restaurant where you expect that, I guess. 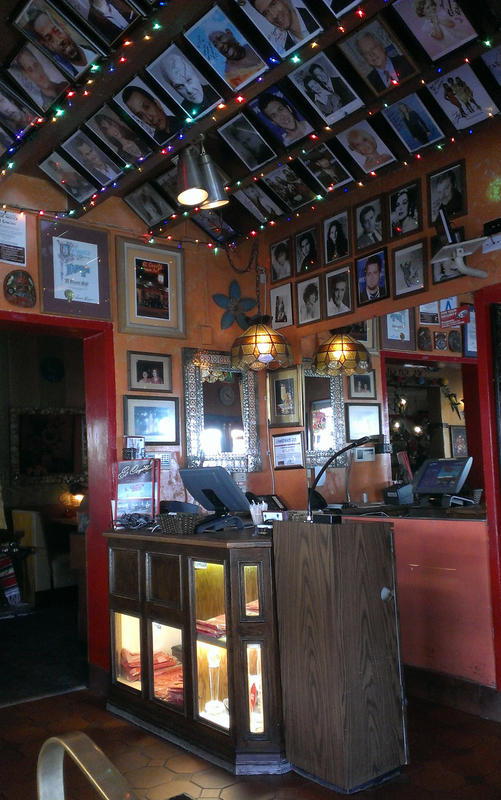 -On one wall, in a frame, was an old El Coyote menu, showing full meals for 90 cents and bottles of wine for $1.50. I was a bit frustrated that there wasn’t any date, though. I mean, I guess it’s probably the original menu but who’s to know? -It always startles me when I see people eating alone without a book, or a phone, or a notepad, or anything to occupy themselves. They must have very rich inner lives, I think, to be able to entertain themselves with just their thoughts. -Here and there the mostly-mural-covered plaster walls are painted to look like some of the paint has peeled away to reveal brick underneath. David (my husband) told me that effect is called Trompe l’Oeil which translates to fool the eye, and is most often seen when people paint windows on walls, that supposedly look out on charming beach scenes or whatever. I assume that’s the sort of thing he knows because he works in theater. Who I Ate With/Things We Talked About: David (my husband); how much fun it is to go swimming with toddlers; the upcoming production of Candide that he will be acting in at the Sacred Fools Theater; his memories of eating at El Coyote as a small child; how awful it would be if someone gave me a parrot for my birthday. What Sort of Ghost I’d Expect to Find if I Believed in Ghosts Which I do Not: A young man who is on his first date with someone he actually finds attractive; he is a little drunk and extremely happy. Note: Unless otherwise stated, all ghosts mentioned in this blog died peacefully of old age and then reverted to the age/place of their choosing. Sharon Tate ate her last meal here on the night she was murdered. This brings back memories! In the 1980s, I worked as a typesetter at The Advocate, and after we “shipped” the paper (sent it to the printer) on Thursday night every other week, we’d go to El Coyote for double margaritas and chicken tacos! The one thing that drove me crazy–they put succotash on their tostadas. Not too authentic…but charming in a wacky El Coyote way.